"Some novels just naturally enslave you, and this is one of them.... serious and gripping... [a] brilliant debut novel." "Sumptuous... [an] explosive tale... Read the book now, then place bets on when the movie version will come out." "... A book to treasure and recommend." "In her book-club friendly debut, McDonnell weaves the intriguing tale of an early 20th-century opera singer torn between her career and motherhood.... McDonnell bases the story on her family history and expertly incorporates surprising facts about the history of fertility research into a twisting tale of miscommunication, love, and unrealized dreams." "Great storytelling and a very modern heroine ... The Doctor and the Diva has the makings of a big success." "The Doctor and the Diva is so beautifully written and lushly set, it was impossible for me to put down, and the characters continue to haunt me long after I turned the last page." "I don't know when I have been so completely entranced and held spellbound by a novel. Brilliant and beautifully written ... McDonnell is a masterful storyteller.... This is a major accomplishment and marks the debut of a tremendous talent." "Love, the longing for family, the demands of art -- in Adrienne McDonnell's absorbing debut, the life of a tempestuous diva struggling to reconcile desires itself becomes a kind of opera." "The Doctor and the Diva is an incredibly moving tale of passion, regret, and ultimate triumph.... Adrienne McDonnell has created some of the most memorable characters I've ever met. A superb achievement." "Filled with frank sexuality and astonishing emotional intimacy, THE DOCTOR AND THE DIVA pulls you in and doesn't let go. Haunting and heartbreaking ... a riveting story of complex individuals struggling with multi-layered passions and unflagging dreams." "A fascinating journey into the hearts and minds of a woman and a man who commit the unthinkable. Brace yourself for the vortex of their deftly drawn lives." "Adrienne McDonnell's THE DOCTOR AND THE DIVA takes her readers into strange and forbidden places, exotic countries, and best of all, the territory of the heart at its most naked and terrifying." "... From the moment we first meet Erika von Kessler, singing beside her uncle's grave, she casts a spell.... Richly imagined ... 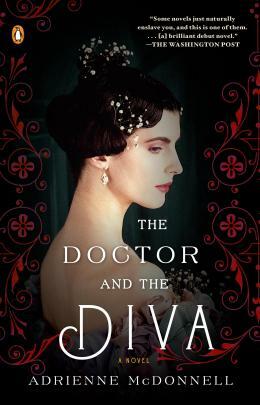 The Doctor and the Diva is an irresistible debut." "From the enticing cover to the last page, Adrienne McDonnell's The Doctor and the Diva is a luscious and sensual debut novel. Erika van Kessler is an aspiring opera diva who is caught between her passions of opera, motherhood and love. Set in foggy Boston, the lush tropical island of Trinidad and opera rich Italy, how could the reader not get immersed in this lushly written libretto. One can actually hear the diva sing through the fluttering curtains onto the streets of Venice or into the hummingbird and orchid rich gardens of Trinidad." "Opera and medicine, two unlikely subjects that come together beautifully in this stunning and haunting novel. As unlikely as the subject seemed at first, I could not put the book down and had to ration my reading time so as to draw it out. Adrienne McDonnell's first work, based on a true story about an ancestor, is lush with promise, ripe with feeling and totally absorbing. And that was only the first chapter. Follow Erika, a woman gifted with a huge talent as she struggles to find her place in a society that demands she give up her operatic dreams to raise and nurture a family. One she can't have. Once Dr. Ravell takes it upon himself to help her, she finds herself with child and those dreams seem banished forever. But there's more to come. Cold Boston turns into steamy South America and then to the beauties of Florence. Will she find her way without losing herself?" "I fell into this richly moving story of a woman who turned her back on motherhood to follow her dream & the doctor who went against all his principles to help her. An exquisitely insightful novel that I found impossible to put down. Adrienne McDonnell is a natural born storyteller. I can't wait to read her next book." "If, like me, you thought that artificial insemination was a recent invention, this novel is a revelation. In 1903, after struggling for years to become pregnant, an opera star meets a Boston obstetrician who has developed a method to help her conceive. This leads to a passionate affair and a decision by her to go to Italy to pursue her career. Somewhat surprisingly, this is all based on a true story." The Doctor and the Diva is probably my favorite of the three [historical novels being reviewed]. You will have to wait until July 22nd to read it, but it will be worth it. This is a novel about romantic obsession and a woman choosing between motherhood and following her dreams. The novel opens in 1903 Boston, and a young couple is seeking the help of Dr. Ravell as they are having trouble conceiving a child. Dr. Ravell ends up falling for Erika, the wife, whose beauty is only surpassed by her operatic voice. Erika has given up on ever conceiving a child and is ready to leave her life behind and pursue an Opera career in Italy. The events that follow spin all three character's lives out of control. This story takes you from Boston, to the lush jungles of Trinidad to the beauty of Florence, Italy. This book was also loosely based on the author's family history and is a lush, passionate and bittersweet story that will not disappoint. "I was lucky enough to receive The Doctor and the Diva via the Early Reviewers program. It's an extraordinary book! If I could give it more than 5 stars, I would. It's THAT good. Stunning to realize that it's a debut novel...."
"...The novel has a majestic scope and it is an ambitious project. Ms. McDonnell delivers. There is a lot about singing and opera in the book, but that adds to the authenticity. It is obvious that Ms. McDonnell is familiar with that world. It was inspiring to me to see how this one woman sacrificed everything to follow a dream." "... As fertility treatments were nearly unheard of in the early nineteen hundreds and what there was was veiled in great secrecy, the novel at this juncture is a historical account of these practices, quite interesting and informative. However, Erika's search for her own personal fulfillment and a channel for her beautiful voice continues. She leaves her husband, her family and she travels to Florence, Italy. The colors, sounds, music, cafes, food, impresarios are described in great detail, nearly to the point where one is able to experience it as if one was there. Erika's quest to display her talent takes her to Trinidad, also another island off the shores of Venezuela. Vegetation of the tropics, wildlife, the beaches, sudden tropical storms, life on a plantation between the owners and serving people are depicted with great writing skill. Erika's return to Florence with her never faltering drive to express her talent, is a most interesting read. The consummate drive of this woman on behalf of her talent is something all women can appreciate and learn from. I enjoyed it immensely." "Brilliant! ... The story is believable and well-paced, right down to a climax that led me to almost shout aloud, "No! It can't happen like this!" The description of what it feels like to release the music inside -- to sing well -- are so true that the author has to have felt that herself, but how did she find the right words? ... I think this novel would be a great book club selection..."